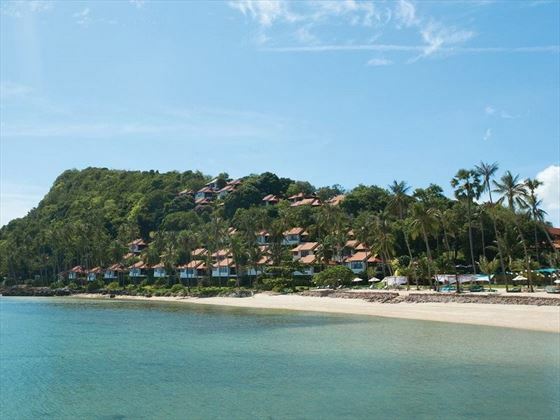 Nestled between 17 acres of gorgeous tropical gardens and a stunning bay shrouded by craggy rocks and limestone formations, Belmond Napasia is positioned within a tranquil corner of Koh Samui Island. Exuding a timeless, elegant charm, this secluded hideaway is the perfect place to forget the outside world and let your troubles melt away. 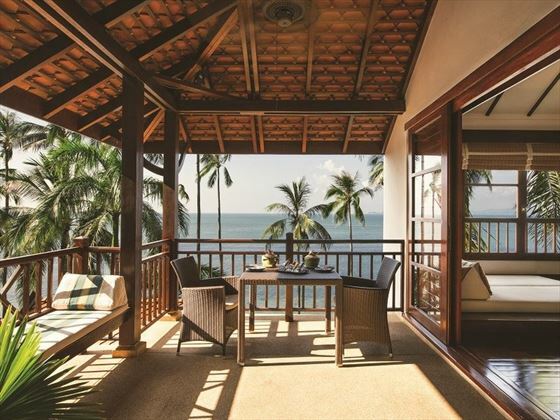 Teak furnishings, traditional weavings and ornate, Thai-inspired decor infuses with elegant colonial touches, whilst the gorgeous natural surroundings create a serene and private sanctuary to enjoy some quality time with family, or an intimate hideaway setting for couples. 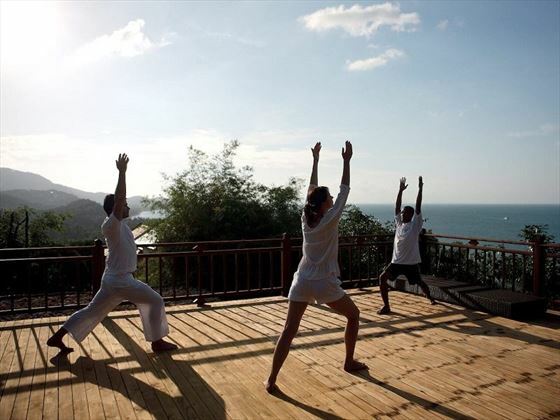 There’s a total of 69 charming villas and 13 extravagant, private residences located all around the lush resort property – some spilling down the hillside towards the beach, others hidden within their own private garden. 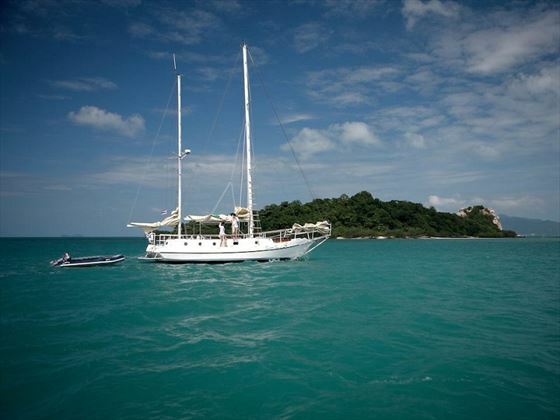 Each spacious villa showcases spectacular views across the Gulf of Thailand, and offers a wealth of luxurious facilities, including complimentary Wi-Fi, spacious, fully-furnished verandas and deep terrazzo soaking tubs. Lai Thai is the resort’s main restaurant, serving delectable fare with locally-sourced ingredients in an elegant and picturesque setting; all herbs and spices are grown in the property’s ‘secret garden’ for the finest and freshest flavours. 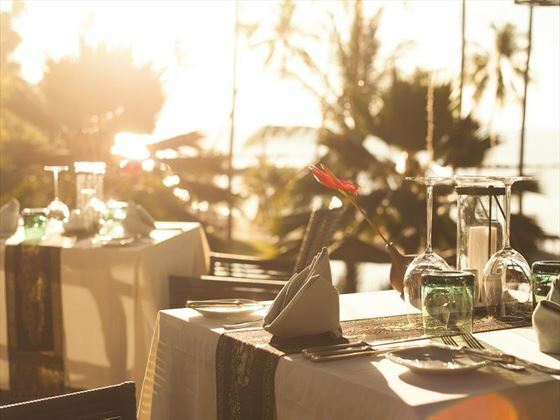 Alternatively, the Beach Restaurant is a wonderful spot to dig your toes into the fine white sand and tuck into a succulent selection of grilled specialities and freshly-caught seafood dishes. 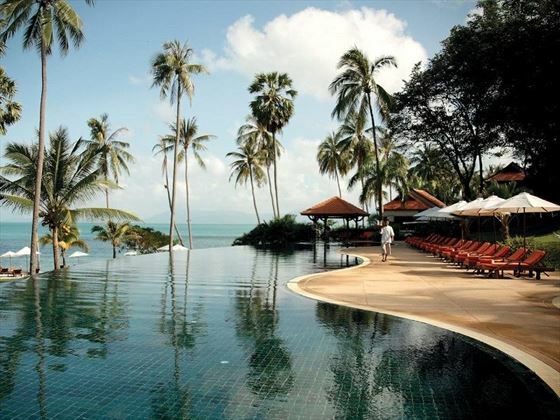 The Infinity Pool Bar serves signature cocktails and light bites directly to your sun lounger, alongside enchanting ocean views and a cool sea breeze. Belmond’s gorgeous beach, lagoon shaped infinity-edge pool, state-of-the-art fitness centre and divine spa make it an ideal choice for luxurious escapes, whilst complimentary land and water-sports, immersive cultural demonstrations, fun excursions and immersive children’s facilities, including a daily rota of fun activities and a kid’s pool, make the resort perfect for family getaways. We love the resort’s secret countryside tour, winding through beautiful rice fields and tropical jungle scenery to reach the resident pigs, goats and water buffalo – a truly unique and wonderful experience. 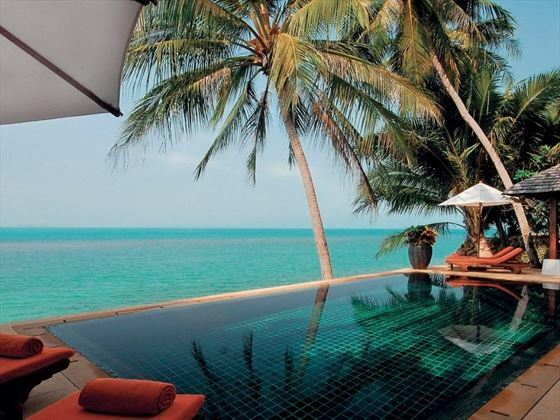 Overlooking the golden sands and luscious palms of Baan Thai Beach on the very northern tip of Ko Samui Island, Belmond Napasai is lined by the clear, azure waters of Thailand’s Gulf, whilst a gorgeous landscape of emerald flora and verdant mountains creates a breath-taking backdrop and a peaceful atmosphere. Secreted away from the island’s more commercial areas, you’ll find a tranquil pocket of paradise with an endless supply of water and land-based activities to enjoy. 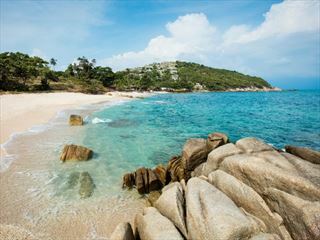 To the north of the resort, you’ll see the beginnings of Angthong Marine Park, a blissful archipelago of lush limestone islands and tri-coloured lagoons teeming with phenomenal marine life. 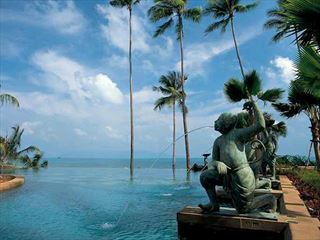 Belmond Napasai is a 25-minute drive away from Koh Samui International Airport, which is reached by regular flights departing from Bangkok. 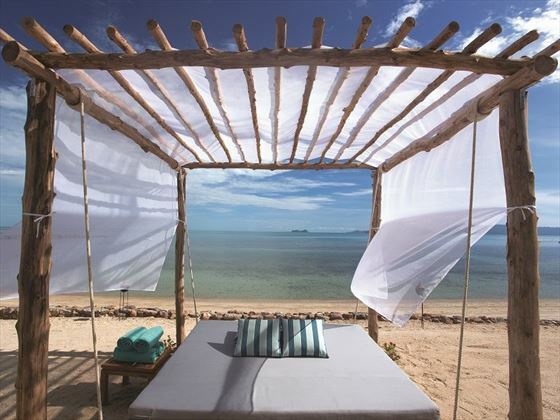 Showcasing spectacular views across the Gulf of Thailand, these spacious and beautifully-appointed villas feature 62sqm of private living space with sumptuous cotton and bamboo interiors to create a fresh and sophisticated atmosphere. Accommodates up to two adults and one child. 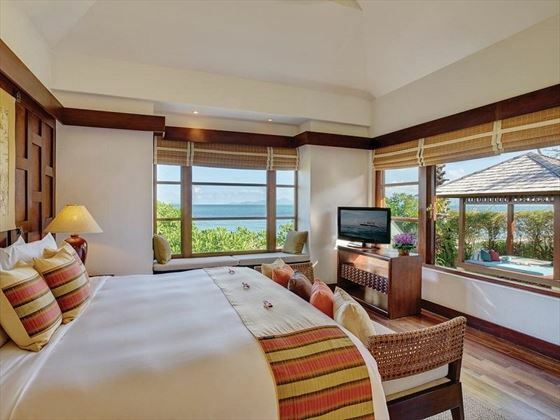 Featuring a similar design, amenity list and layout to the Seaview Villas, these sublime 62sqm hideaways are nestled into lush tropical gardens, set upon the pristine beachfront with phenomenal ocean views. Accommodates up to two adults and one child. Spanning over 93sqm of sumptuous, private living space with a bedroom outdoor living area, inviting waterfall bath and private massage Sala, these one-bedroom villas are appointed with modern indulgences and rich Thai spirit. 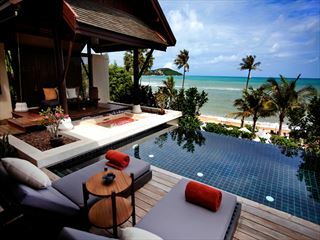 Choose from a Garden Villa, hidden within a luscious, private garden with ample space and secluded privacy, or the Beachfront Villas are set directly on the golden sands of Baan Tai Beach with stunning views of the clear, azure waters – both choices are ideal for small families, accommodating up to two adults and two children. These gorgeous 93sqm villas are appointed with a similar layout and design to the Garden and Beachfront one-bedroom Villas, but also boasts a luscious private garden with a large pool. Accommodates up to two adults and two children. Enjoy the complete luxury of independent home-away-from-home accommodation, while benefitting from the full range of sumptuous facilities in the resort. Spanning over a breath-taking 400sqm of opulent, private living space, the residences showcase unparalleled oceanfront panoramas from spacious living, dining, sleeping, kitchen and private terraces, as well as an expansive infinity-edge pool and massage Sala. Choose from one, two, three or four bedroom configurations, dependant on how many guests will be staying. Sample delectable local meats and freshly-caught seafood at Lai Thai, showcasing a menu of expertly woven local specialities and international favourites, beautifully presented and created with herbs and spices from the resort’s Secret Garden. Dine inside the ambient restaurant, or out on the sea-facing balcony canopied by lush palms. 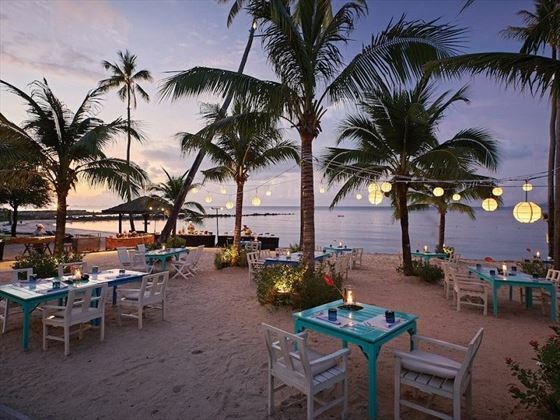 Follow the mouth-watering aromas of succulent grilled meat and seafood to this gorgeous beachfront restaurant, adorned with swaying palm trees and strings of glowing paper lanterns; the perfect venue to enjoy your favourite cocktails, delicious food and a relaxed ambience with your toes in the fine white sand. Set beside the stunning zero-edge pool with enchanting sea views, Infinity offers tempting light meals and delightful signature cocktails to enjoy as you soak up the sun on a poolside lounger, or shelter beneath the shady parasols with a sundowner in hand.